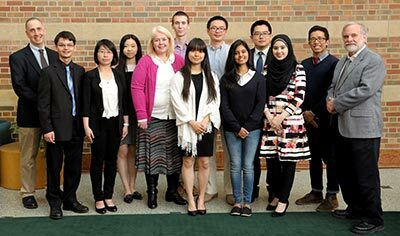 Congratulations to the following students who were recently named recipients of the Beckman Institute student awards. The awards were presented during a ceremony on Saturday, April 23, in the Beckman Institute atrium. Supported by funding from the Arnold and Mabel Beckman Foundation, the fellowship offers University of Illinois undergraduate students the opportunity to pursue interdisciplinary research at the Institute during the summer. Claire Boyer is a junior in speech and hearing science with a speech pathology concentration. She has been working in the Adult Learning Lab with Elizabeth Stine-Morrow, professor of educational psychology and full-time faculty member in the Human Perception and Performance Group, examining social and emotional cues in language processing in order to help to identify areas of compensation for cognitive decline in aging. Xuelin Guo is a junior in materials science and engineering, with a minor in computer science. She has been working with John Rogers, professor of materials science and engineering and chemistry and full-time faculty member in the 3D Micro- and Nanosystems Group, on guided solidification of eutectic optical metamaterials onto three-dimensional microstructures. In honor of Erik Haferkamp’s life and achievements, his family, friends, and colleagues established the Erik Haferkamp Memorial Fund, which provides awards to undergraduate students who are conducting research in neuroscience at the Beckman Institute. Kimberly Sam is majoring in molecular and cellular biology with a minor in Spanish and chemistry. She is looking at the consequences of repetitive low-force mechanical injury on neurons with Parijat Sengupta, research assistant professor in the Bioimaging Science and Technology Group and bioengineering, and Stephen A. Boppart, professor of electrical and computer engineering, bioengineering, medicine and co-chair of the Bioimaging Science and Technology Group. The Janssen Family Award supports summer research for undergraduate students in neuroscience or psychology, with preference to support female students. Rachel Pharris is a junior in psychology. She has been working in the Adult Learning Lab with Elizabeth Stine-Morrow, professor of educational psychology and full-time faculty member in the Human Perception and Performance Group, studying the cognitive processes of aging and how aging affects memory, learning, and decision making. These awards allow promising undergraduates to pursue research in neuroscience or psychology at the Beckman Institute in collaboration with clinicians in the Neuroscience Institute at Carle Foundation Hospital during the summer. Misha Ahmad has a double major in psychology and global studies, with an emphasis on global health. Under the direction of Ryan Dilger, assistant professor of animal sciences and director of the Piglet Nutrition and Cognition Laboratory, she plans to develop procedures to perform immunohistochemistry and immunofluorescence. Nhan Huynh is a senior in molecular and cellular biology with a minor in electrical and computer engineering. He works in the lab of Dan Llano, assistant professor in medical molecular and integrative physiology, investigating the massive set of projections that the auditory cortex (AC) sends to the inferior colliculus (IC) in order to study the neural pathways of information processing and create devices that can exploit the innate circuitry of the brain. In honor of Nadine Barrie Smith’s life and achievements, Nadine’s husband, Andrew Webb, established the Nadine Barrie Smith Memorial Fund that is supported by Nadine’s family, friends, and colleagues. The fund provides fellowships to female engineering graduate students who are conducting research in the general field of medical imaging (e.g., ultrasound, optical, magnetic resonance) at the Beckman Institute. Saumya Tiwari is an M.D./Ph.D. student in bioengineering and was previously a Beckman Graduate Fellow. She is working with Rohit Bhargava, professor of bioengineering and full-time faculty member of the Bioimaging Science and Technology Group, on developing a new imaging technology to identify and predict disease progression. Yang Zhu is pursuing her Ph.D. in bioengineering. Working with Michael Insana, professor of bioengineering and full-time faculty member in the Bioimaging Science and Technology Group, Zhu’s project in the ultrasound laboratory focuses on determining the microstructures that cause acoustic scattering and the signals viewed in clinical images. In honor of Thomas and Margaret Huang’s contributions to science, technology, and society, the Thomas and Margaret Huang Fund for Graduate Research was established by the Huang family and their friends and colleagues. The fund provides awards to graduate students who are conducting research in the Human-Computer Intelligent Interaction (HCII) theme at the Beckman Institute. Shiyu Chang is a fifth-year Ph.D. student working under the supervision of Thomas Huang in the Image Formation and Processing (IFP) Group. His research focus is on “similarity” in networks.